Two issues which, as with the concept of a “post-racial society”, the public prefers to believe have been fully covered and resolved. These are pervasive racial inequity in school discipline, particularly the role schools play in the school to prison pipeline and racialized opportunity tracking, both within and between schools. Harper bluntly asserted that both of these still exist in schools and are extremely troubling. This point was of special interest to me as one of my sons is currently teaching in a charter school in the Midwest and has raised many of these concerns and challenges in our conversations over the past year. The erasure (through lack of media coverage) of Asian, Native American, and Pacific Islander students’ educational needs. More attention needs to be paid to young people in these groups, particularly in terms of tracking their experience in education and their outcomes. Recruitment of white students by white nationalist groups. This is not a prank or a random, situational situation, Harper warned, but rather a calculated, organized effort. Racist encounters on the college campus. According to Harper, racism continues to negatively impact the college experiences students of color have. He encouraged reporters to provide “deep, truth-telling coverage” of these experiences. 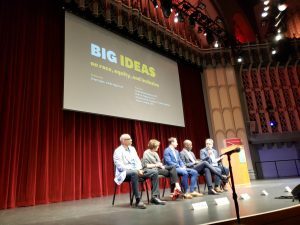 Harper’s brief presentation was followed by a panel discussion “Big Ideas on Equity, Race, and Inclusion in Education”, which set the tone for what we could look forward to over the three-day conference.